Beautiful woman. I love her hair.and eyes. I want be him! I really love the cropped hair with the mock turtleneck of the coat. This woman knows how to play up her features … very modelly! Do you think she is wearing the coat backwards somehow? it looks lovely, complementing her pretty neck, and feathery lashes. Big beautiful eyes in black and white. Just stunning! Your portraits are amaaaazing! They are beautiful and also I feel like they capture something of the moment and the person. Love! our body it is vital that we ingest the proper mounts of each to maintɑin proper health. Did you realize that ever since Garance cut her hair you have regularly been posting women with all types of short hair styles…I like this one the best I think..
Actually, Scott started doing this a couple of years ago. I had been tiird of all the rapunzel hair so was well pleased and encouraged him to shoot more. Quite the opposite. Scott started posting pictures of women with short hair while she had her long hair in a bun going, and I kept thinking that Garance would eventually cut hers because Scott was admiring short hair so much….and eventually she did. and great eyelashes! She looks like a modern Audrey Hepburn. Really great short hair. She looks gorgeous. Come on!! That’s great everything!!! and great eyelashes!! She looks like a modern Audrey Hepburn! The stunning girl in the pic is Anna Paola Tassielli, fashion student and designer. Love that you highlight great shorter haircut styles. I feel that all of the “fashion mags” today hire models with the same longer length hair in the belief that it is more versatile. I think long hair in a ponytail is a bore. The last time I was looking for my next great haircut I should have come here rather than a magazine. Anyway, thanks for the diversity. Is this one of the Olsen twins? Wow the eyes, the lips, the jaw line… What! She has great hair too…? If Maria Menounos cut her hair, she’d look like this. Why are North American women SO caught up in having long hair?? She reminded me Edie Segwick’s hair. Gorgeous women. is it just me or does she remind of Sienna Miller but with dark hair? She reminds me of a woman I knew many years ago. Suddenly, I’m 25 years old again. Beautiful eyelashes! It’s incredible the result that just a good mascara can give: simple, but effective. What a beautiful woman ! Wow! What a stunning woman! what for a great shot! Who is this women? 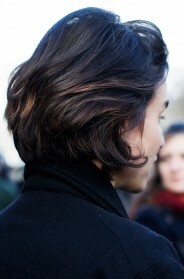 I want a hair cut like hers but i can only see the front of it.